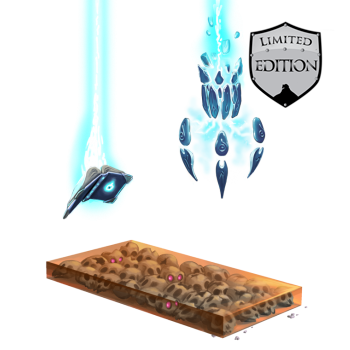 The Skello-ton Base is a Limited Edition base and can no longer be acquired by Hunters. Yes, it's true that zombies possess an insatiable hunger for brains. Brains this, brains that, it's brains, brains, brains all the time! But after several huge meals of brains, a zombie's tastes begin to turn to dessert, and the discerning zombie longs for nothing more than that classic treat: Skell-O! The Skello-ton Base is composed entirely of Skello, which will leave zombies' mouths watering. It's so jaw-droppingly good that the zombies will even forget to chew the brains in their mouths, letting them tumble to the ground instead. While definitely gross, this allows you to collect a portion of those Brain Bits for use in crafting Brain Charms. Even more effective when paired with the Brain Extractor or Maniacal Brain Extractor weapons! The Skello-ton Base was available for purchase for 435,000 gold, 1 Mousataur Skull and 8 Cobwebs from Haunted Terrortories Trapsmith during the Halloween 2014 event. It cannot be refunded. The Skello-ton Base collects Brain Bits from the various zombie mice. The effect is greater when paired with the Brain Extractor or Maniacal Brain Extractor weapons. Brain Extractor - Increases the special effects of the Skello-ton Base. Maniacal Brain Extractor - Increases the special effects of the Skello-ton Base. Brain Charm - Requires Brain Bits to craft and increase the encounter rate of the various zombie mice. Super Brain Charm - Requires Brain Bits to craft and increase the encounter rate of the various zombie mice. 14 October 2014: The Skello-ton Base was released at the start of the Halloween 2014 event.